Microsoft’s User Account Control—the box that pops up and asks “Do you want to all ow the following program to make changes to this computer?” incessantly—has noble roots, as it’s intended to let you know when software is making administrator-level tweaks to your operating system. That makes it handy for thwarting malware, but geez, the pop-ups are annoying—especially if you stick to safe corners of the Web and run third-party security software. 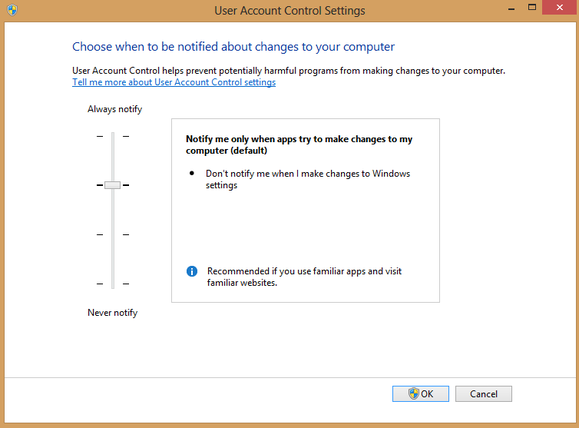 How to disable Windows needs your permission to continue. 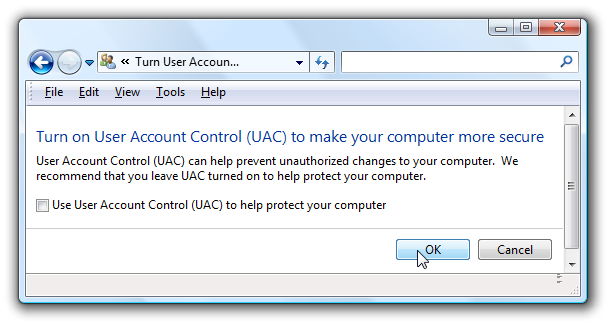 If you feel confident enough to disable UAC, doing so is pretty easy. First, open the Control Panel by navigating to Start > Control Panel in any version of Windows that includes a Start button, or by heading to Windows 8’s tiled Start screen, typing Control Panel, and clicking it. You’ll need to reboot your computer before the changes take effect, but you should be all done with annoying prompts. Misplaced my Administrator password and all is frozen. Profile will not load, therefore , I cannot sign on as the principal user on my computer. .I sign on via secondary user but cannot change or even use system recovery without the password.. HELP!!! Do you live in near one of our stores? One is in Johnston RI, the other is North Smithfield RI? If so the best bet would be bring in the computer. If not then visit http://pcsupport.about.com/od/toolsofthetrade/tp/passrecovery.htm and give those options a try. Will drop into No. Smithfield store next week. Just had a “tune” up there a few months ago. Just cannot sign on in my user name. Reads “cannot load profile.. ” Can do nothing as the Administrator prompt pops up and I have misplaced my password. Thanks for the reply! Could be a virus or some sort of update that corrupted a file needed to load the profile stop in and we will be happy to take a look.